Tube compression royalty for your mixes. As Manley Labs' flagship compressor since 1994, the Variable Mu is a tube and transformer-driven classic that exudes hand-made craftsmanship. A gold standard among mixing and mastering engineers, the Variable Mu adds clarity and cohesion to stereo buses or your entire mix. 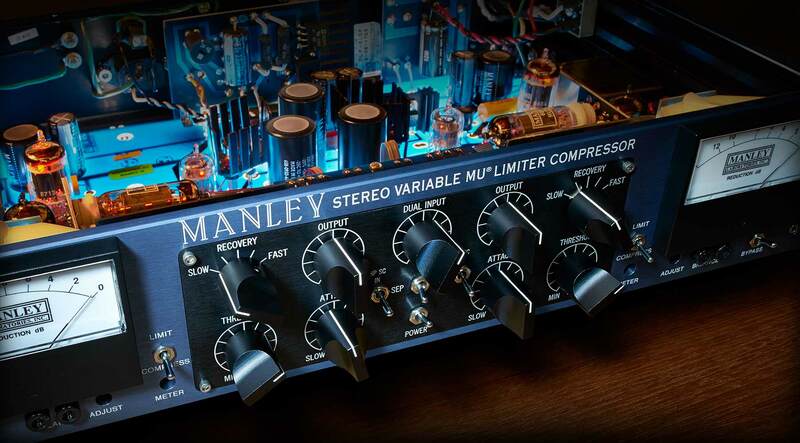 Developed under Manley Labs' rigorous scrutiny, the Manley Variable Mu Limiter Compressor plug-in is a thorough emulation of this legendary tube limiter, and is based on the coveted “6BA6 T-BAR Tube Mod” unit. Now, its famed sound is available exclusively for UAD-2 hardware and Apollo interfaces. While the Manley Variable Mu uses the remote cut-off style gain reduction found in the Fairchild and other classic limiters, it has a sound and character all its own. Its classic dual-triode gain reduction design is constantly re-biased by the sidechain control voltages, creating a unique variable gain compressor with stunning transparency. This lets you treat source material with velvety-smooth gain reduction, while infusing warm harmonic content, free of audible compression artifacts. The Manley Variable Mu Limiter Compressor plug-in can be used on single instruments such as bass or a lead vocal, or on subgroups like strings or horns. But its raison d'être is on the mix bus, where its expert features can unify your mixes with a rich, hi-fi fit and finish. Parameter linking allows simultaneous adjustment of both channels with stereo signals. When unlinked, the plug-in's Mid/Side processing is actually improved over the hardware, providing phase accurate stereo imaging. The High Pass Sidechain filter prevents compression to frequencies lower than 100 Hz — letting you compress, say, overheads, while retaining punchy bottom-end. Plug-in-only controls Dry/Wet, Mix, and Headroom give you more colors to paint your mixes. Dry/Wet Mix offers easy parallel compression — perfect for polishing vocals and more. Finally, the Headroom control lets you optimize the Variable Mu’s overall level to your playback system.